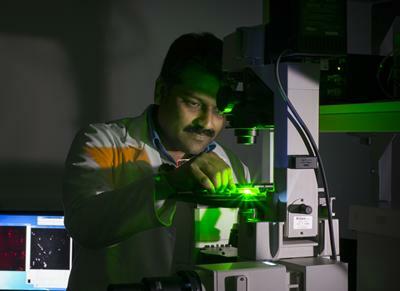 Dr Sumeet Mahajan will aim to deliver an innovative microscope imaging system for IVF Clinics. A number of pioneering research projects at the University of Southampton have been awarded funding as part of a £6.6 million investment by the Engineering and Physical Sciences Research Council (EPSRC) into the future competitiveness and creativity of the UK economy. The proposed project will aim to deliver an innovative microscope imaging system for IVF Clinics that will yield a transformative advance in the identification of viable eggs, embryos and sperm, creating an enabling technology resulting in an increase in conception rates and a reduction in repeat cycles of expensive IVF treatment. The project represents a radical change in alloy design and aims to identify, prepare and validate a novel class of nanostructured alloys for engineering. If successful, the project could open a new design route to fabricate alloys with unique strength and thermal stability allowing a significant increase in temperature, particularly in jet engines leading to a dramatic reduction of fuel consumption. The aim of this research is to construct a new resilience-based bridge design and construction, inspired by the mechanics of the human spine. The new bridge column will be manufactured off-site and assembled on the construction site, demountable, constructed using low-carbon composite materials, extremely durable against environmental threats, and resilient to dynamic and extreme loadings (e.g. high-speed trains and abnormal traffic). Gravity gradiometry is used to identify underground oil and gas reserves, monitor ocean circulation, detect geological faults, and measure the shape of the earth's gravitational field, which is necessary for accurate navigation. This project is aimed at making this technology more common and widespread, particularly in civil engineering to enable the discovery of utilities without exploratory digging (reducing roadworks), locate unrecorded mineshafts and sinkholes or complement general surveys for assessing ground stability. This project proposes a new interface design for semi-autonomous cars called iSeat, an intelligent driver seat acting as a co-pilot measuring the current mental and physical engagement of the driver and allowing safe, coordinated and timely transitions between different levels of autonomy. iSeat will be made of robotic structures serving the feedback purpose as well as providing monitoring capabilities through direct contact with humans during any level of autonomy. “Engineers are creators, innovators and problem solvers; their pioneering work creates a better future for us all,” said EPSRC Chief Executive, Professor Philip Nelson. “EPSRC continues to invest in this vision by supporting the engineers of tomorrow, and the projects announced today are testament to our firm belief that novel, transformative research will help to make the UK a more prosperous nation. The announcement of these successful projects comes as the EPSRC launched its campaign to make 2018 the Year of Engineering, a government-supported campaign to celebrate the world and wonder of engineering. Throughout 2018, hundreds of organisations across the UK will showcase the world of engineering and look to inspire the next generation of engineers by bringing young people face-to-face with engineering experiences and role models.